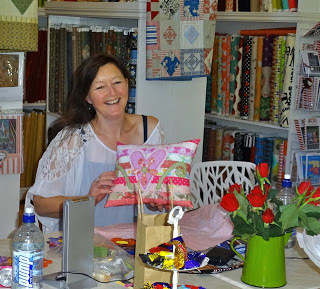 Shez and I always do a one on one swap at each Mill Rosie get together and this is what I made for her this time a Natalie Lymer stitchery made into a wall canvas,I think by the look on Shez's face she liked it :) Our next swap is going to be by designer Anni Downs. Sharon spoilt me with a lovely bag of goodies,the choccies are long gone,they were eaten on the way back home lol and my baushka doll is now sitting on a shelf in my sewing room.Thanks Sharon I loved it all! Shez also gave me a bag full of goodies,a zuchinni & home made pickles which I'll show a pic of after the 8th of March when I'm allowed to open them up lol, Mmmmm biscuits with cheese,ham and home made pickles what could be more perfect :) Thanks Shez..not long to wait now. Beautiful photos Barb, All those gifts are gorgeous. I'm so glad you are part of this wonderful group. I'm really looking forward to the next meeting too. Your cushion looks great Barb. The projects you and Shez made each other are gorgeous. I've never been a founding member before either! I love your cushion! And the pictures are great. Looks like it was a perfect day out. What fun !! It was a wonderful day !! Barb it looks like you always have a lovely day there. LOvely girls, lovely swaps and lovely place to go. Its so nice to see pics of such a great day. Everyone looks like they had so much fun and the swap gifts are amazing.